In the last 40 years, the human population has nearly doubled, but human activity has caused catastrophic decline in other species. Butterfly, bee, and beetle populations have seen reductions of 50% or more. Birds, bats and frogs that depend on insects for food are showing population reductions of 28-58%. Major drivers of the catastrophic collapse are habitat destruction, agricultural intensification, pesticide use, and climate change. One study shows that numbers of freshwater vertebrates such as fish and frogs have dropped by more than 80%. Declines are being driven by water pollution, pesticides, and destruction of aquatic insects. The degradation of wild populations was not necessary. We should try to mitigate some of this damage, or there will be consequences such as loss of pollinators, loss of aquatic food, and a highly restricted food supply. 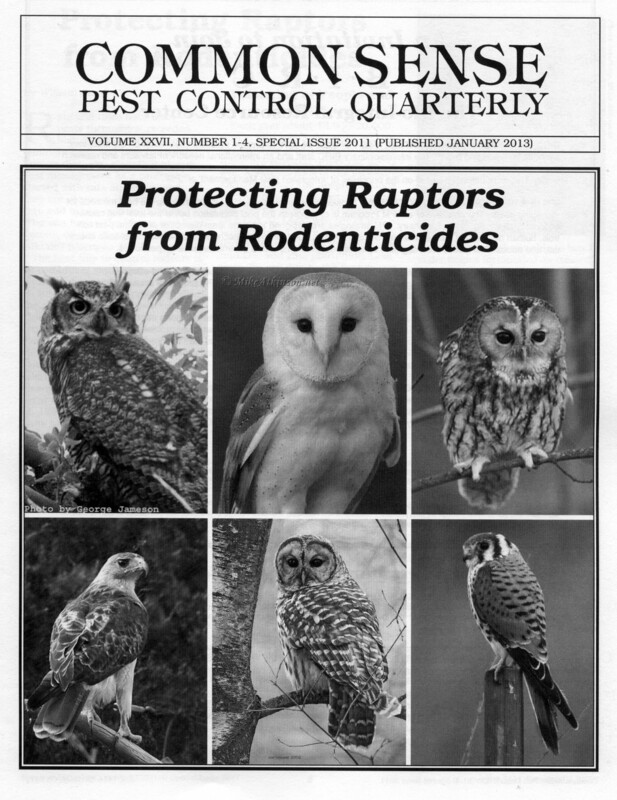 This publication briefly reviews insect decline and makes suggestions to mitigate the damage. For example, we should increase regenerative and organic agriculture. Away from crop areas, farmscaping can be used to increase resources for beneficial insects. 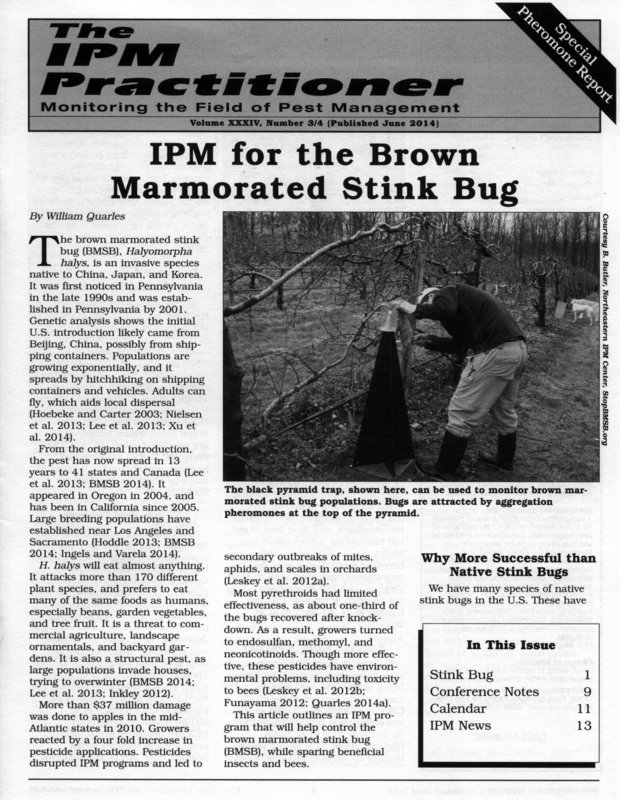 IPM should be used to control pests. Backyard gardens and roadside plantings can compensate for some of the habitat loss. Life on earth is being reconfigured from diverse populations in ecological balance to a simplified ecosystem of humans, human food, and human pests. Unless we reverse the wholesale destruction of wildlife, reduce pesticide applications, and mitigate global warming, we are headed toward the Silent Spring pictured by Rachel Carson. If you want to read this publication, please click here. Hard copies are $8 each, including postage. California residents add 9% tax. Quantity discounts are available until supplies run out. BIRC is a non-profit that depends on the support of the public. If you would like to make a tax-deductible donation to help us continue our work, become a BIRC member, or order a publication, use the BIRC order form here. About 280 million pounds of the herbicide glyphosate are applied each year. There is widespread contamination of breakfast cereal, wine, and other commodities. Glyphosate has been found in 93% of people tested in the U.S. According to the International Agency for Research on Cancer (IARC), glyphosate is a probable human carcinogen. Thousands of lawsuits have been filed against Monsanto and Bayer. Applicators are most at risk, and a jury trial in California resulted in a $289 million dollar award to a landscape professional dying of non-Hodgkins lymphoma. 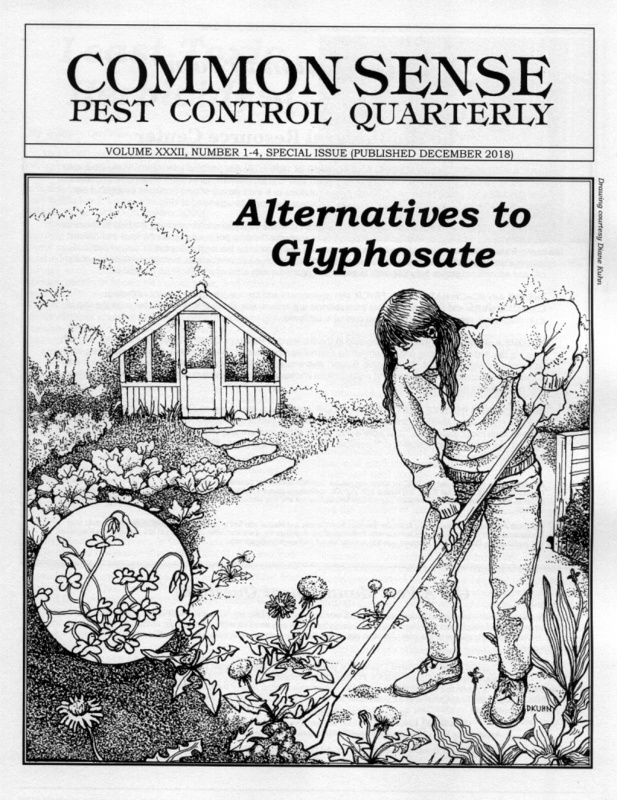 Glyphosate alternatives are needed in GMO crops because of weed resistance. Alternatives are also needed for roadside weed control, for municipal landscapes, for golf courses, playing fields, and weed control in homes and gardens. Cities are concerned about potential liability and are actively seeking alternatives. IPM methods can provide a comprehensive solution to weed management. These include weed mapping, cultural controls, mulching, microbials, mechanical controls, steaming, flaming, solarization, allelopathy, and application of least-toxic herbicides. This issue includes a review of IPM weed management methods and an update on the efficacy of least-toxic herbicides. About 35 million people in the U.S. use marijuana on a regular basis. It is the fourth most popular recreational drug after caffeine, alcohol, and tobacco. Marijuana is legal for medical use in 31 states, and it has been decriminalized in 13 other states. Recreational marijuana is legal for adults in nine states. But Cannabis is still illegal under federal law. Marijuana is the largest cash crop in the U.S. with an estimated value of $35.8 billion each year. Nearly $700 million in imported hemp products are sold in the U.S. each year. Hemp has been grown for thousands of years. It is a renewable source of fibers for ropes, bags, paper, building materials, and other products. In blighted rural areas where coal mine and tobacco jobs have been lost, hemp could provide economic revitalization. A federal law legalizing hemp production was introduced this year. Because federal law prohibits Cannabis production, there is a pest management problem in the states where it is legal. The EPA will not register a pesticide with marijuana or Cannabis listed on the label. Thus, most EPA registered pesticides cannot be applied. Yet many states allow marijuana to be grown, sold, and consumed. To make the best of a bad situation, cooperation between state and federal agencies has led to lists of approved pesticides, mostly soaps, oils, and biopesticides. Because pesticides allowed are somewhat limited, the situation provides an ideal opportunity for IPM methods. IPM management should result in less environmental pollution, fewer pesticide exposures, and less pesticide contamination of the product. Less pesticide contamination is important because the California law requires that commercial marijuana be tested for pesticide residues. Nearly 300 insect pests have been associated with Cannabis. Flower and leaf pests outdoors are hemp borers, budworms, leafminers, and green stink bugs. Stalks and stems are attacked by borers and beetle grubs. Frequent and sometimes serious pests include aphids, whiteflies, mealybugs, mites, and chewing bugs. Among the worst pests are hemp borers, budworms, aphids, and mites. IPM methods include biological controls, least-toxic pesticides, and cultural methods. Illegal Cannabis operations outside are often marked by pesticide and fertilizer pollution. State licensed legally grown Cannabis provides an opportunity to reduce environmental pollution. Because it is still illegal under federal law, USDA organically certified Cannabis cannot be produced. But an Eco or IPM label for Cannabis grown with organic methods and low environmental impact is possible. Also in this issue is the article Global Warming and Water Pollution and highlights of the 2017 ESA Meeting in Denver, CO. The monarch butterfly, Danaus plexippus, is one of the best known environmental icons. But the migrating monarch is in trouble. Over the last 20 years, overwintering populations have dropped by 90%. Glyphosate applications to GMO crops in the Midwest have killed the milkweed it needs to survive. Other causes are herbicide applications to roadsides, overuse of insecticides, destruction of flowering plants and nectar, and extreme weather conditions caused by global warming. This Quarterly reviews monarch biology, and outlines a strategy that will result in Bringing Back the Monarchs. The strategy includes establishing milkweed and nectar plants, converting lawns to Monarch Way Stations by sheet mulching, planting milkweed along highways, and raising awareness of laws designed to help the monarchs. Lists of the best milkweed and nectar plants are provided. Monarch butterflies have survived the dinosaurs and have probably been migrating for one million years. We should not let pesticide pollution and human activity destroy them. Working together, we can bring back the monarchs. Not just monarchs, but bees and birds are also threatened. Honey bee colony losses are currently about 44% a year, and wild bees have also been impacted. Many bird species are in decline, both rare species and common ones. The Audubon Society has found that the 10 most common bird species have seen a 70% decline. Causes for the decline are similar: pesticide pollution, development, and loss of habitat. Bees can be encouraged by providing nesting sites and floral resources. Birds will respond to plantings that provide seeds and nectar. Lists of flowering plants that will encourage birds and bees are provided. 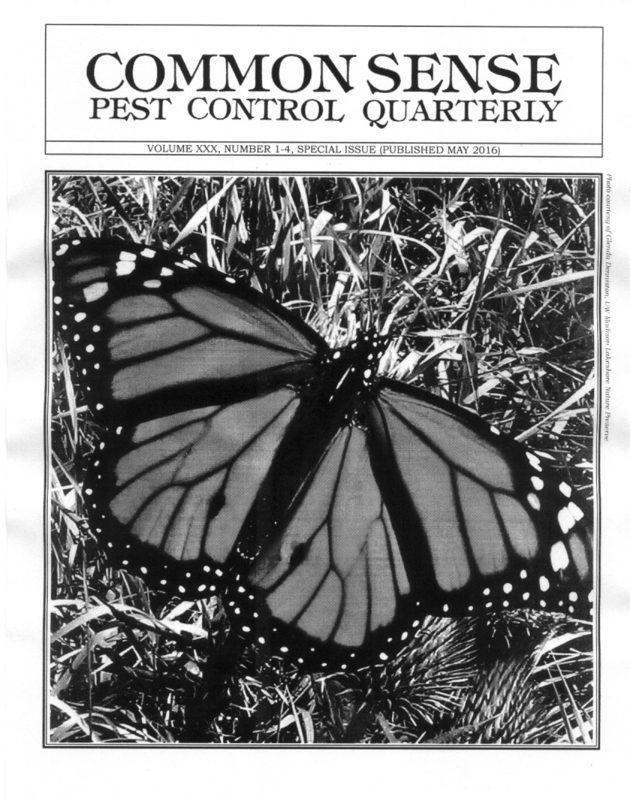 Overall, this issue provides a pathway to a balanced garden with increased pollination, increased biocontrol, and enhanced habitat for birds, bees, and monarchs. 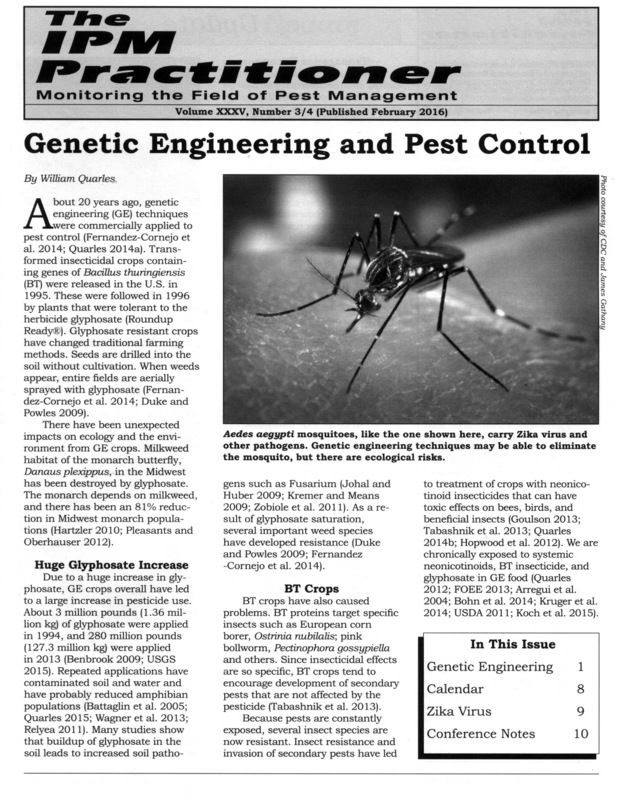 The lead article in our latest issue, is Genetic Engineering and Pest Control. About 20 years ago, the first transgenic crops engineered for pest control were commercialized. These transgenic crops have been controversial, and about 90% of the U.S. population would like to see these crops labeled as Genetically Modified Organisms (GMOs). These crops have led to unexpected problems, such as destruction of monarch butterfly habitat, contamination of soil and water with pesticides, reduction of amphibian populations, and in some cases increased soil pathogens. Another consequence is systemic exposure to glyphosate, neonicotinoid, and Bacillus thuringiensis pesticides in our food supply. There are questions about safety that have not been fully answered with rat toxicology experiments. Overuse of these crops has led to resistant insects, resistant weeds and other problems. To fix the problems that genetic engineering has caused, new crops have been created that will lead to increased pesticide use, and again to loss of efficacy—truly a genetic treadmill. Insects are also being engineered for pest control applications. Releases planned are either self limiting or sustaining. Self limiting transgenics will die out after a few generations. Sustaining releases will use CRISPR gene drives to transform or eliminate entire species. An example is the Aedes aegypti mosquito. GE crops brought unexpected problems, and engineered insects represent an escalation of risks. Engineered insects also pose ethical questions. Should we transform or eliminate a wild species just to solve a pest or pesticide problem? Should corporations be allowed to produce the corporate bee, a transgenic resistant to neonicotinoids and other proprietary pesticides? Mass releases of transgenic organisms to solve a pest or pesticide problem is a subject too important to be left to corporations and regulators. Transformation or elimination of a wild species should be a topic debated by the entire society. Once the transgene genie is released, it may be impossible to put it back into the bottle. This issue also contains an update on Zika Virus and Birth Defects. About 11,000 women who gave birth in Brazil in 2015 were likely infected with Zika. About 4,000 babies were born with birth defects. Zika may be interacting with agrochemicals or other factors to cause the problem. Spotted wing drosophila, Drosophila suzukii, is a tiny fruit fly causing big trouble. Its quick reproduction time, lack of competition or natural enemies, increased survival due to global warming, and dispersal in infested fruit shipments has allowed it to spread with astonishing speed. In five years, this invasive insect has spread completely through the U.S. It is now an established pest in many fruit production areas. It lays its eggs in ripe fruit just before harvest, targeting raspberries, blackberries, blueberries, strawberries, stone fruit such as cherries and peaches, and even grapes and figs. Fruit full of maggots cannot be sold, and 20% crop loss is typical. Economic damage in just California, Oregon, and Washington can be $500 million each year. The pest attacks both commercial crops and backyard fruit. It has a wide host range, switching to an alternate host when preferred food is not available. When it overwinters, it may choose non-host plants for shelter. This article outlines an IPM approach that can manage the pest, while sparing bees and beneficial insects. IPM methods include monitoring, early cultivars, sanitation, mass trapping, repellents, netting, biological controls, and biopesticide sprays. The IPM Practitioner’s 2015 Directory of Least-Toxic Pest Control Products contains more than 2000 products produced by more than 600 suppliers. The Directory is unique because it is compiled by IPM technical experts, includes specific product descriptions, and is organized in concert with the IPM decision making process. Thus, it is easy to find a biological control for an aphid, a pheromone for a moth, or a bait for an ant. The Directory gives contact information and access to suppliers of biocontrol products, traps, pheromones, physical controls, tools, barriers, and least-toxic chemical control products. The Directory is a valuable asset for anyone trying to practice IPM and reduce pesticide exposures. Products listed are useful for structural pest control, greenhouse production, home gardening, and organic farming. An online version is available if you click here. Those who want to buy a hard copy of this 48-page resource can order it from the Bio-Integral Resource Center (BIRC), PO Box 7414, Berkeley, CA 94707. Cost is $15 including mailing and handling. California residents add 9% sales tax. A convenient order form is available here. Hard copies of the Directory are excellent assets for IPM Training Programs and Conferences. Quantity discounts are available until supplies run out. Call BIRC at 510-524-2567 or email us at birc@igc.org for a price quote. 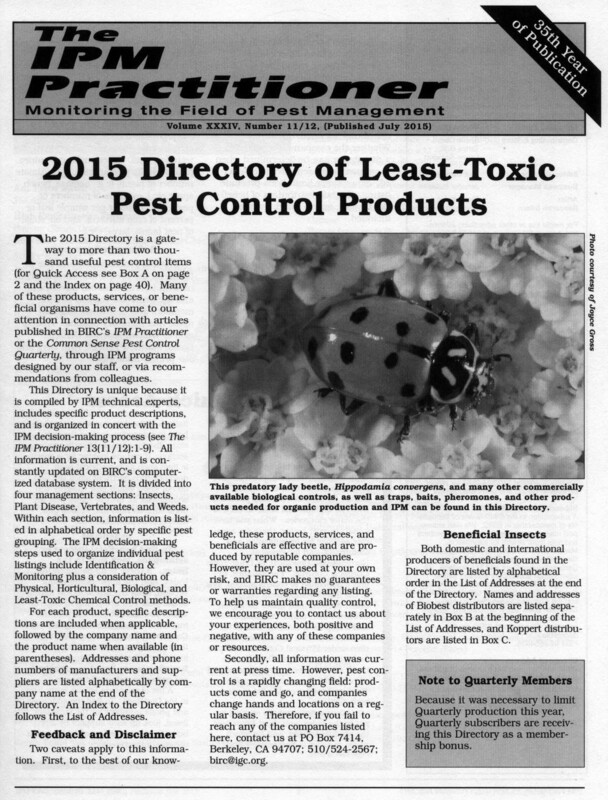 Acknowledgement The 2015 Directory of Least-Toxic Pest Control Products was supported, in part, through a grant from StopWaste.Org. BIRC is extremely grateful to StopWaste.Org for its assistance in producing the Directory. 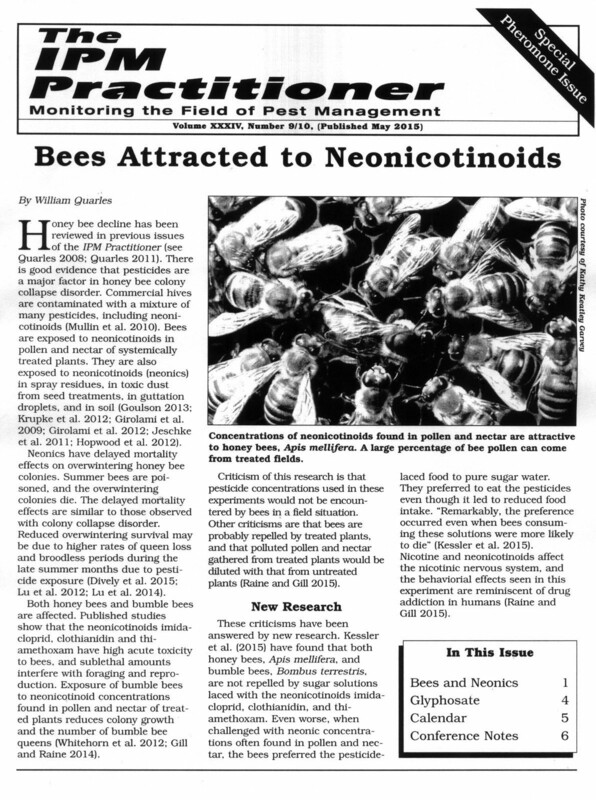 The lead article of our new publication reviews the latest information on neonicotinoids and bees. The USDA has just released a beekeeper survey showing that more than 40% of U.S. commercial honey colonies were lost last year. Pesticides are one of the problems, and bees are actually attracted to neonicotinoids at concentrations seen in nectar and pollen. Neonicotinoid concentrations in pollen and nectar from canola seed treatments are large enough to reduce field densities of wild bees. Seed treatments may not even be needed, as no yield increases are generally seen in seed-treated soybeans. As a precaution, the EPA has stopped approving new outdoor uses of neonicotinoids. In another article, we discuss the International Agency for Research on Cancer (IARC) study showing glyphosate is a probable human carcinogen. We briefly review glyphosate toxicology. Exposure to glyphosate is widespread. Millions of pounds are used each year, and there is evidence that applicators absorb and excrete it. Amounts found on soybeans in the marketplace can exceed the EPA standards for glyphosate in drinking water. Finally, we review cutting edge research on pheromone technology from 16 presentations given at the Entomological Society of America’s 2014 Conference. Plant volatiles are being used to enhance pheromone attraction. Pheromone mass trapping has become more practical. Pheromone dispersal technology is being applied to attract pollinating bees. Pheromone sources such as puffers reduce labor costs, and structural pest control is benefitting from an Argentine ant trail pheromone. If you want to read this publication, please click here. Hard copies are $8 each including postage. California residents add 9% tax. Quantity discounts are available until supplies run out. BIRC is a non-profit that depends on the support of the public. If you would like to make a tax-deductible donation to help us continue our work, become a BIRC member, or order a publication, use the BIRC order form here. 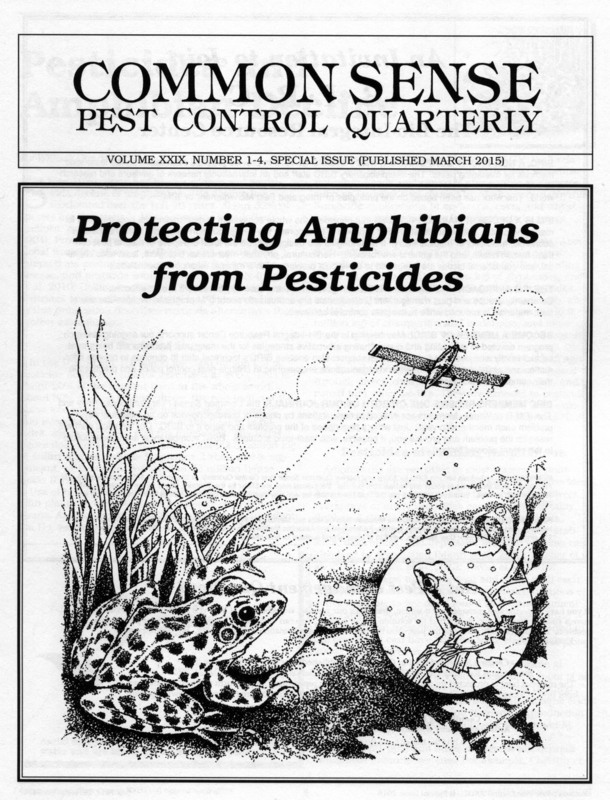 Our latest publication reviews the connection between pesticides and amphibian decline. In some cases, amphibians are killed directly upon exposure. There are also sublethal effects such as delayed metamorphosis, increased predation, reduced size, reproductive problems, deformities, and depressed immune systems that lead to destruction. We identify which pesticides are causing the worst damage. Amphibians are exposed through direct overspray, pesticide drift, rainfall, and runoff into water bodies. About 83% of urban streams and 57% of agricultural streams are contaminated with enough pesticide to be hazardous to aquatic life. Windblown pesticides from aerial applications are killing amphibians in remote mountain areas. We also provide solutions to the problem. Some pesticides such as glyphosate, atrazine, endosulfan, chlorpyrifos, and chlorthalonil should be used much less or restricted. Glyphosate and atrazine together represent 30% of all conventional pesticides used in the U.S.
We can also protect amphibians by using IPM methods in agriculture, homes, gardens, and professional landscapes. A combination of cultural methods, resistant plants, conservation biocontrol, and reduced risk pesticides can be effective. Buying organic food, replacing lawns with native plants, creating backyard water gardens, helping with wetland restoration, and using mechanical methods, mulches, and competitive plantings for weed control can help protect amphibians from pesticides. Backyard gardens with resources for amphibians, birds, butterflies, bees and beneficial insects are aesthetically pleasing and can help prevent the relentless slide of amphibians toward extinction. If you have bed bugs, do not panic. 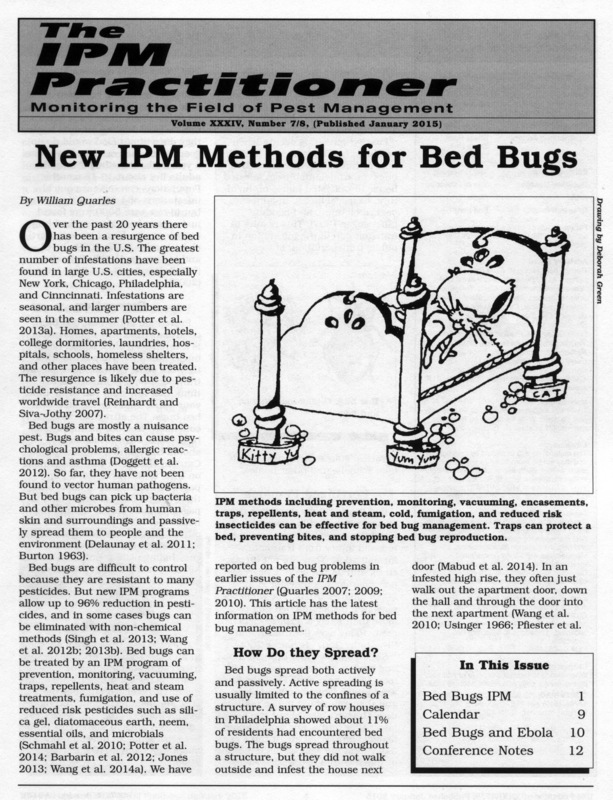 Our latest publication reviews new IPM methods for bed bug control. Because bed bugs are resistant to many pesticides, pesticide applications alone are generally not effective. Pest management professionals are using IPM methods such as prevention, monitoring, vacuuming, mattress encasements, traps, repellents, heat and steam, cold, fumigation and reduced risk pesticides. Heat, carbon dioxide fumigation, and treatments with amphorous silica such as diatomaceous earth or silica gel can be very effective. New traps and pheromones are making detection easier. Reduced risk pesticides such as neem and essential oils can provide relief. IPM methods reviewed in this publication can reduce pesticide applications by 96%, and in some cases, bed bugs can be controlled entirely by non-chemical methods. Can Bed Bugs Carry Ebola? The second article in this publication reviews the relationship between bed bugs and pathogens. Bed bug bites can cause extreme irritation, psychological problems, allergic reactions and asthma. But bed bugs also can carry pathogens on, and inside their bodies, and can excrete pathogens in their feces. Bed bug vector competence for human diseases has never been proven, but mechanical transmission of Trypanosoma cruzi, which causes Chagas disease, has been shown in the laboratory. There are strong suspicions that hepatitis B can be transmitted in this way. Ebola is spread by touching infected humans and their belongings, and the Ebola virus can persist in the environment from 14 to 50 days. Since bed bugs can pick up pathogens from human skin and carry them on their bodies, they may be able to passively carry Ebola in this way. Bed bugs have been shown to ingest and excrete pathogens such as Q fever, caused by Coxiella burnetii, and HIV. If other pathogens can be carried in this way, they can probably carry Ebola. Whether or not they can actually transmit the disease depends on amount of virus needed to initiate human infection. If you want to read this publication, please click here. Hard copies are $8 each including postage. California residents add 9% tax. Quantity discounts are available until supplies run out. BIRC is a non-profit that depends on the support of the public. If you would like to make a tax-deductible donation to help us continue our work, become a BIRC member, or order a publication, use the BIRC order form here. 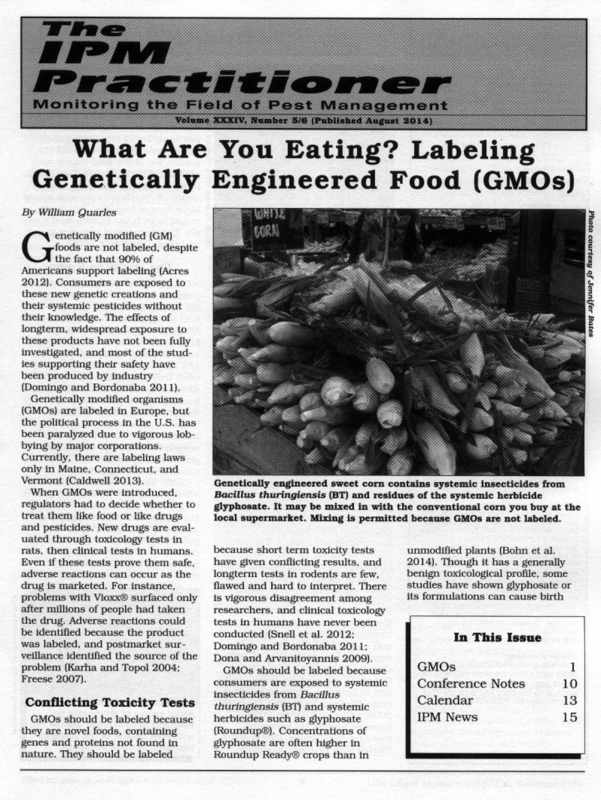 Our latest publication reviews labeling of genetically engineered food. These products are not labeled despite the fact that 90% of Americans support labeling. GMOs are labeled in Europe, but the political process in the U.S. has been paralyzed due to vigorous lobbying by major corporations. GMOs should be labeled because they are novel foods, containing genes and proteins not found in nature. Some GMOs contain systemic pesticides, and the effects of longterm exposure to these products have not been fully investigated. Short term toxicity tests have given conflicting results, and longterm tests in rodents are few, flawed and hard to interpret. One by one comparison of known nutrients in substantial equivalence tests cannot identify all possible sources of toxicity. New allergens created by the transformation process may escape detection. A flood of new products is headed toward the market, including fresh produce and engineered animals. Overwhelmed regulators may make mistakes. Labeling is needed because knowledge of genetics is incomplete, research is still active on recently commercialized technology, and regulatory failures could occur. Industry is lobbying for no regulation at all. Some GMOs are associated with environmental disasters such as destruction of monarch butterfly habitat and production of superweeds. A pesticide treadmill of new crops resistant to 2,4-D and other toxic herbicides will cause increased environmental pollution and more concentrated herbicide residues in food. GMOs should be labeled because consumers are being deprived of their right to make choices. The courts have ruled that the way money is spent can be speech, and some legal scholars believe that food choice is a form of protected speech. GMOs should also be labeled because America is in the midst of an epidemic of food related diseases. Those afflicted with food allergies, asthma, clinical gastric upset, diabetes, fatty liver and other diseases should have all the information they need to make changes in their diet. The invasive brown marmorated stink bug, Halyomorpha halys, has spread to 41 states in the 13 years since its introduction to the U.S. It is a threat to commercial agriculture, landscape ornamentals, and backyard gardens. It is also a structural pest, as large populations invade houses, trying to overwinter. The pest is exploding in the U.S. due to lack of specific natural enemies, prolific reproduction, wide host range, and effective overwintering strategies. It is cold tolerant and is reaping the benefits of global warming. Growers have responded to stink bug proliferation through increased pesticide applications that are disrupting IPM programs, causing outbursts of secondary pests such as mites, aphids, and scales. 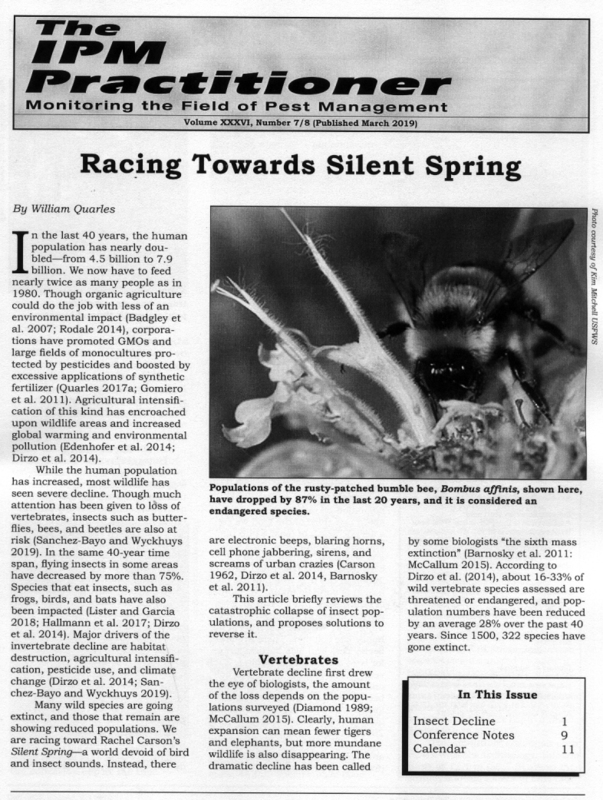 This article reviews monitoring, pheromone trapping, barriers, repellents, biological controls, biopesticides and other IPM methods that will manage H. halys populations, while sparing beneficial insects and bees. 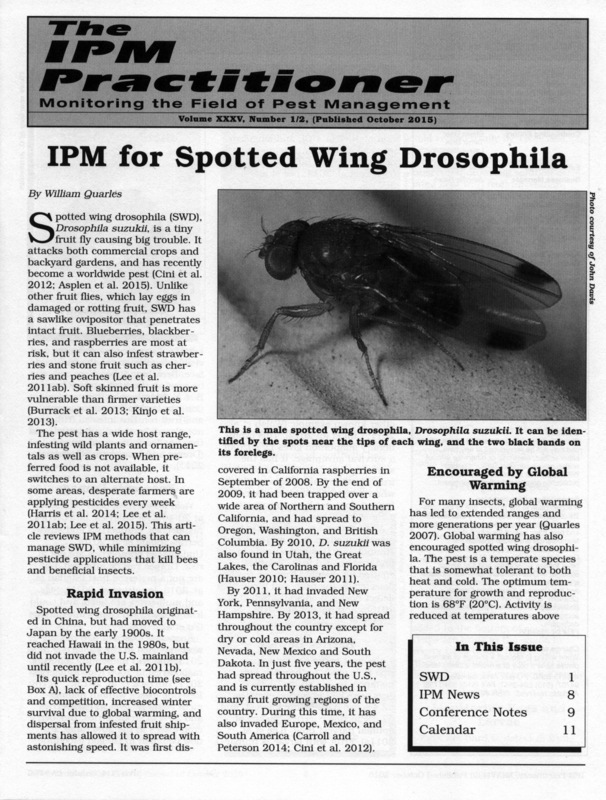 Also included in this Special Pheromone Issue is a Pheromone Report from the ESA 2013 Meeting in Austin, TX and the latest IPM News. About one-third of the managed honey bee colonies in the U.S. are dying each year. Part of the problem is exposure to systemic insecticides called neonicotinoids. Neonics are applied in field crops, orchards, parks, landscapes, backyard gardens, on ornamentals, lawns, pets, and in structural pest control. Some of them are extremely persistent, providing a large window of exposure. At least 45% of U.S. cropland is treated. 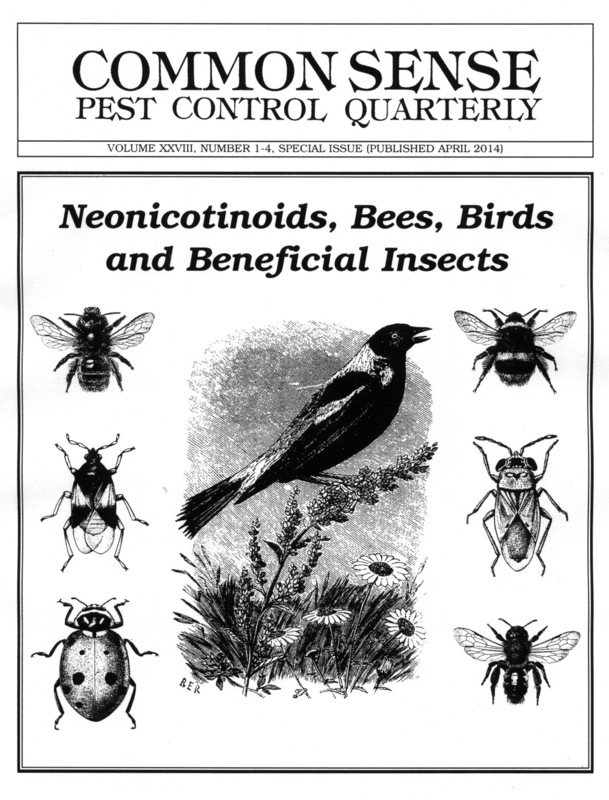 This new issue of Common Sense Pest Control Quarterly reviews effects of neonicotinoids on bees, birds, and beneficial insects. Bees and beneficials are exposed to toxic residues from sprays, and to poisonous nectar and pollen from systemic treatments. Predatory insects are killed through secondary poisoning from consuming pest insects that contain neonics. The largest impact on birds is through neonic seed treatments. One treated seed is enough to kill some birds. There are also sublethal effects on bird reproduction. This issue also suggests alternatives to neonicotinoid applications. In almost every case, cultural and ecological changes can be combined with IPM methods, biological control, biopesticides, and other low impact pesticides to correct the pest problem. Avoiding pesticides, choosing native plants, breaking up monocultures, hedgerow plantings, growing organic gardens, and buying organic food are some of the choices that we can make to protect bees, birds, and beneficial insects from neonicotinoids. Specific plantings are recommended to encourage bees, birds, butterflies and other pollinators. IPM methods are suggested to manage pest problems. Citrus trees in the U.S., Brazil, Mexico and elsewhere are being killed by an aphid-like insect called the Asian citrus psyllid, Diaphorina citri. The insect feeds on the phloem of Citrus trees. 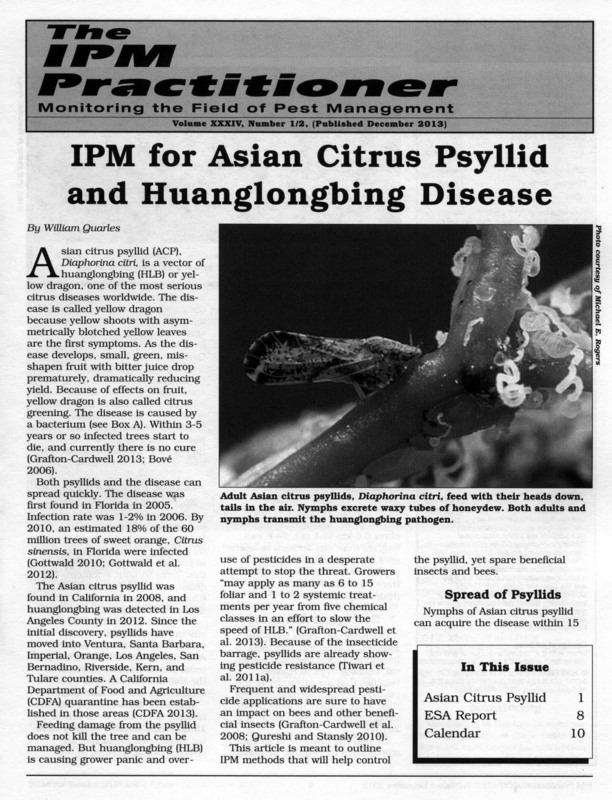 In the U.S., psyllids transmit the bacterium Candidatus Liberibacter asiaticus, causing a disease called citrus greening or huanglongbing (yellow dragon). The first signs of infection are yellow shoots and leaves with asymmetric yellow blotches. As the disease develops, small, green, misshapen fruit with bitter juice drop prematurely, dramatically reducing yield. After about 3-5 years, infected trees die, and currently there is no cure. Both the disease and the psyllid have been found in California, Texas, and Florida. About 18% of the 60 million sweet orange trees, Citrus sinensis, in Florida have been infected. The disease has caused the death of about 40 million citrus trees worldwide. Huanglongbing is leading to grower panic and the overuse of pesticides in a desperate attempt to stop the disease. As many as 6-15 foliar and 1 to 2 systemic pesticides are applied each year from five different chemical classes. This barrage is leading to pesticide resistance and damage to bees and beneficial insects. 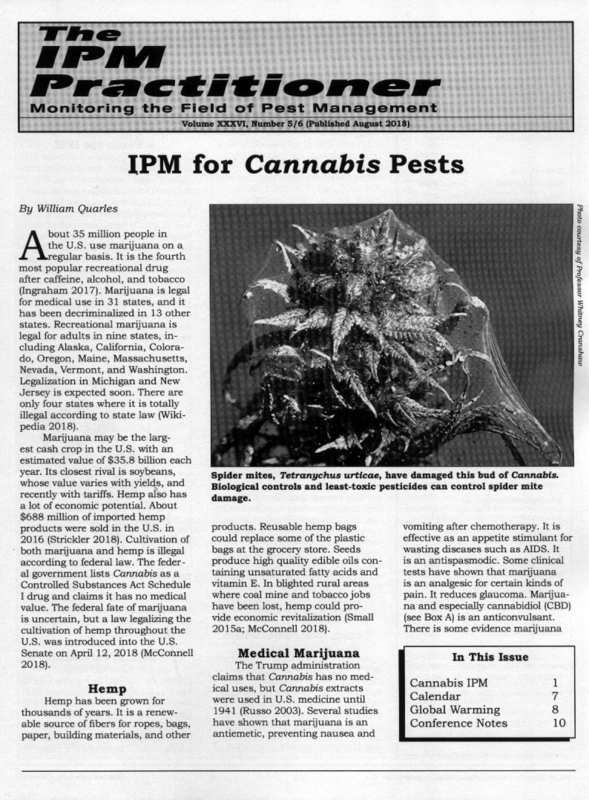 This article reviews IPM methods that can manage the psyllid and the disease without destroying bees, beneficial insects and other elements of the environment. 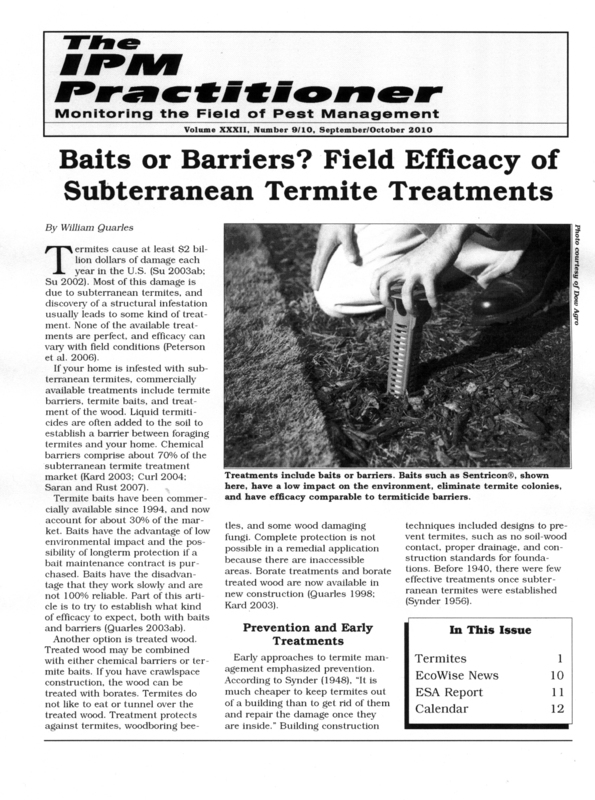 If you have subterranean termites and cannot decide whether to use chemical barriers or termite baits, this classic publication can help you with the problem. Once you decide between bait or barrier, the article can help you choose the most effective product and minimize effects on the environment. The publication draws on field tests conducted by the USDA, termite research specialists, and the experience of pest control operators to identify the most effective and least toxic treatments for subterranean termites. The publication also has new information about the biology of termites. New technology has revealed the genetic structure of termite colonies. Colonies containing thousands of termites may be produced by one queen. An average property may have 6 genetically independent termite colonies capable of attacking your home. When your home is attacked, it is usually only one of these colonies. The efficacy of termite baits is sometimes questioned. Although effects are complex, published studies show an expected efficacy of 85-100%. If you would like to read this new publication, click here. Hard copies are $8 each including postage. California residents add 8.75% tax? Quantity discounts are available until supplies run out. BIRC is a non-profit that depends on the support of the public. If you would like to make a tax-deductible donation to help us continue our work, become a BIRC member, or order a publication, use the BIRC order form here. Millions of bats in the U.S. have been killed by a mysterious new disease. Death is associated with a fungus, Geomyces destructans, that attacks their skin. White fungal lesions appear on their bodies and on their noses, which has led to the name "white nose syndrome." G. destructans has attacked at least nine different bat species, and according to biologists at the U.S. Fish and Wildlife Service, more than 5.5 million bats in 20 states have died since 2006. The same fungus is present in Europe, but mass die-off of bats is not happening there. The immune system of U.S. bats cannot deal with the disease. This article reviews the possible causes of immune suppression in bats. Pesticide exposure is one possible cause. Due to their long lifetime and voracious appetites, bats are vulnerable to accumulation of pesticides and environmental contaminants. 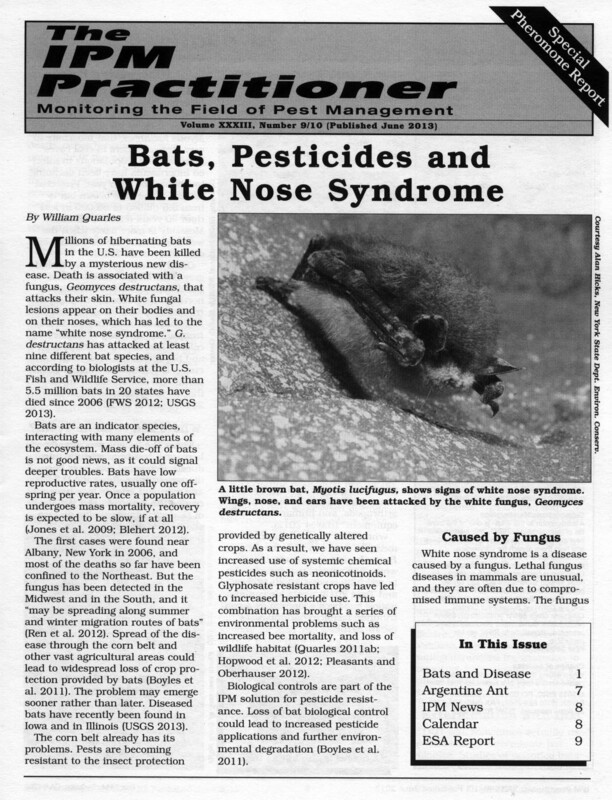 One possible solution to white nose syndrome is conversion to IPM methods or increased organic production, especially near areas of bat hibernation. Bats eat tons of pest insects each year. Loss of bat biological control worth an estimated $22 billion annually could mean increased costs for crop production and increased use of pesticides. Considerable environmental damage from pesticides is already occurring. Overuse of glyphosate is leading to habitat destruction for wildlife. Pests are growing resistant to genetically engineered crops, and application of neonicotinoid seed treatments are contributing to honey bee death and decline. Mass die-off of bats could make honey bee problems worse, due to increased pesticide applications. New Biopesticides for IPM and Organic Production. 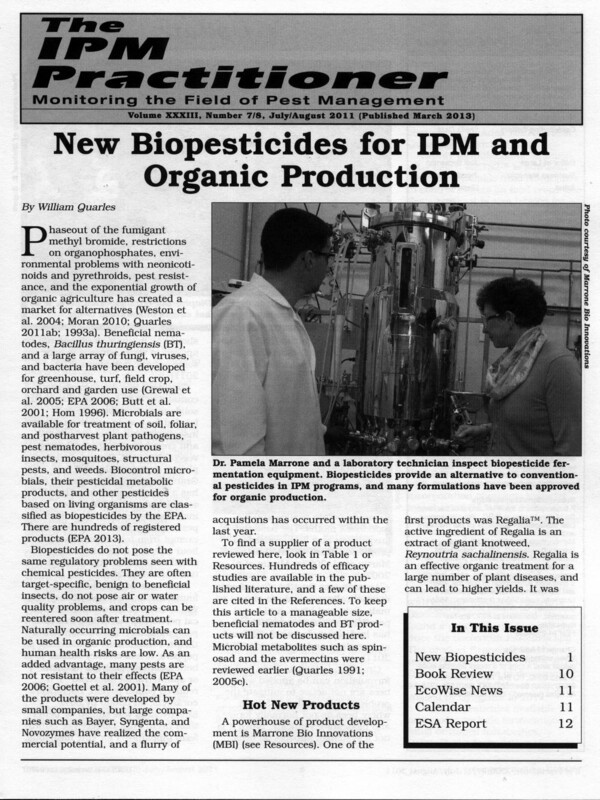 March 2013: This IPM Practitioner publication reviews the latest biopesticide products. Biopesticides are either living organisms or have their origins in living organisms. They are often target specific, benign to beneficial insects, do not pose air or water quality problems, and risks to human health are low. Insects are not resistant to them, and some formulations are certified for organic production. The publication includes a list of EPA registered products and suppliers. Biopesticides include herbicides, fungicides, insecticides and nematicides. A new bioinsecticide called Grandevo™ should be useful in management of the destructive Asian citrus psyllid, Diaphorina citri. Another bioinsecticide called MET52™ has potential as a non-chemical treatment for tick control. This product should be good news in areas overrun by Lyme disease. Phaseout of the soil fumigant methyl bromide has led to registration of toxic and carcinogenic materials such as 1,3-dichloropropene for nematode control. New biopesticides such as Econem™, Melocon™, and DiTera™ are now available that provide a non-chemical alternative for nematodes. Biofungicides such as Rootshield™, Mycostop™, and Soilgard™ provide non-chemical alternatives for soilborne pathogens. Products such as Regalia™, Serenade™, and Sonata™ provide treatment for plant diseases. Regalia and many of the other products are certified for organic production. New bioherbicides have been developed that can help control weeds without the environmental pollution seen with some chemical herbicides. Some of these are commercially available, others are in the last stages of EPA and California registration. January 2013: About 13,000 to 20,000 people each year are poisoned by rodenticides, and most of these are children. About 80% of the hospitalizations are due to second generation anticoagulants, mostly brodifacoum. Of the 95,000 pets poisoned each year, about 74% is due to brodifacoum. This type of rat poison is also causing widespread poisoning of wildlife, including raptors. August 2012: BIRC’s latest publication reviews the problems resulting from the extensive use of genetically engineered (GE) crops and systemic pesticides. 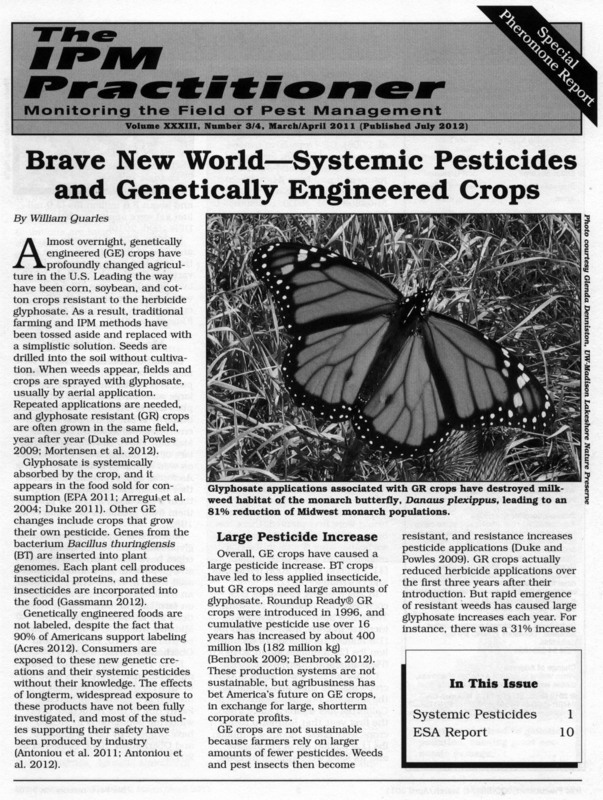 Production of GE crops (Roundup Ready™) resistant to the herbicide glyphosate has resulted in a number of environmental problems, including an 81% reduction of Midwest monarch butterfly populations. Excessive glyphosate applications may be impacting amphibian populations and increasing populations of soil pathogens. Soil pathogens are making systemic seed treatments with fungicides necessary. Extensive reliance on GE crops with systemic insecticides from Bacillus thuringiensis (BT) is leading to insect resistance. The resulting seed treatments with systemic neonicotinoid insecticides are causing deaths of honey bees. Dependence on glyphosate for weed management in GE crops has led to creation of superweeds. The agribusiness solution is a repeat of the pesticide treadmill—crops engineered for resistance to multiple herbicides. Planting of these new crops will at least triple the amount of 2,4-D and other controversial herbicides being used in agriculture. A better solution is a return to IPM principles that allow both sustainable crop production and environmental protection. 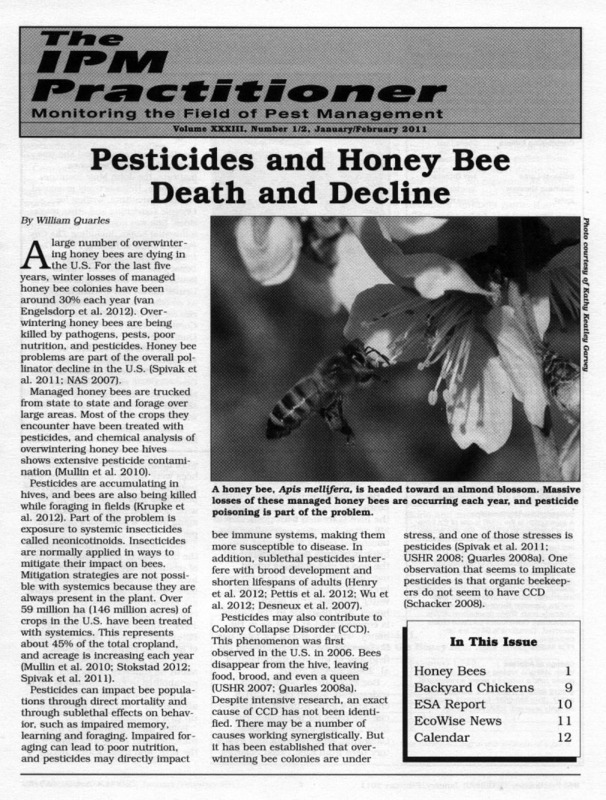 June 2012: BIRC’s latest publication reviews honey bee death and decline due to extensive use of pesticides. Chemical analysis of hives in 23 states show bees, pollen, and wax combs are extensively contaminated with pesticides. Contributing to the problem is the use of systemics in field crops, especially corn. Use of systemics means that pesticides are always present in the plant and mitigation strategies are impossible. About 45% of U.S. cropland is treated with systemics and use is increasing each year. In many cases, systemics are not needed because IPM alternatives are available that manage pests without killing bees. This issue also includes an update on urban farming, the EcoWise IPM Certification Program for pest control professionals, and the latest information on bed bug pheromones and traps.